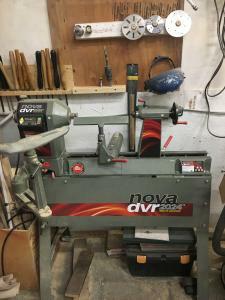 Nova DVR 2024 Wood Lathe from TeknaTool. It is a direct drive, variable speed lathe with rotating head stock. Bore size is 2MT on both the head stock and tail stock. Wood turning chisels, faceplates and other accessories are found on the wall behind the lathe. Thread on Head stock is 1 1/4" 8 tpi. Purchased from Normand Tools in Cambridge in July, 2015.